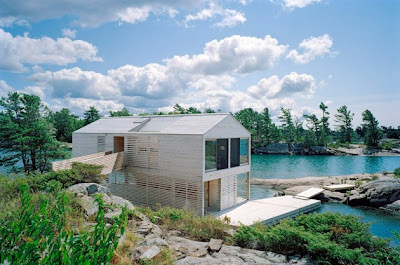 The architects responsible describe this floating home on Lake Huron as the intersection of vernacular house typology and the shifting site specific conditions of the unique place; an island on Lake Huron. Which in this instance means the intersection of cottage country and Canada's four seasons. This looks everything and nothing like the Lake Huron cottage country I know. Just without the Busch-lattes.